This dangly belly bar features a sterling silver stars design which is set with amethyst colour crystals and is available with either a 8mm or 10mm surgical steel shaft. 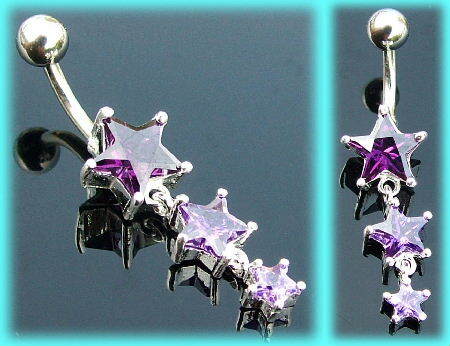 This pretty belly bar features a graduated 925 silver star dangle which is set with three amethyst colour jewels, and the design, which moves freely, measures 25mm x 10mm. These navel bars, which are only suitable for use in healed belly button piercings, are available with either a 8mm or 10mm surgical steel shaft. This ever popular design is also available with other colour gems, including clear, light pink, red, black, sapphire blue and dark green. The best eCommerce software by ShopFactory powers P5931. All-in one eCommerce and shopping cart software.